If your pup is in need of a bath, Hoppy’s Carwash & Café has multiple locations across the Gold Coast and Brisbane Region with Dog Wash bay’s. Our easy-to-use dog washes are conveniently located, coin operated, quality product systems that will have your beloved pet loving their bath and leaving freshly clean. Our dog wash bays are the easiest and cleanest way to wash your dog. Simply deposit your money and get the minimum 10 minutes (with one-minute additions as needed) to shampoo, condition, rinse and dry your dog. Each dog wash is fully self-contained – keeping your pet safe and secured in the bay – and has multiple options so that you are in control of how you want your dog washed. Hoppy’s Carwash & Café uses only top-quality, pet-friendly Fido products in all of our dog washes, in order to ensure a safe, comfortable, skin-safe, pet-safe experience. Each of our dog wash bays are suited to both big and small dogs, and have everything that you need to make your beloved pets coat silky-smooth. We remove all of the mess and frustration out of cleaning your pet, and ensure that no matter how busy you are, your dog can look silky clean and leave smelling fresh. 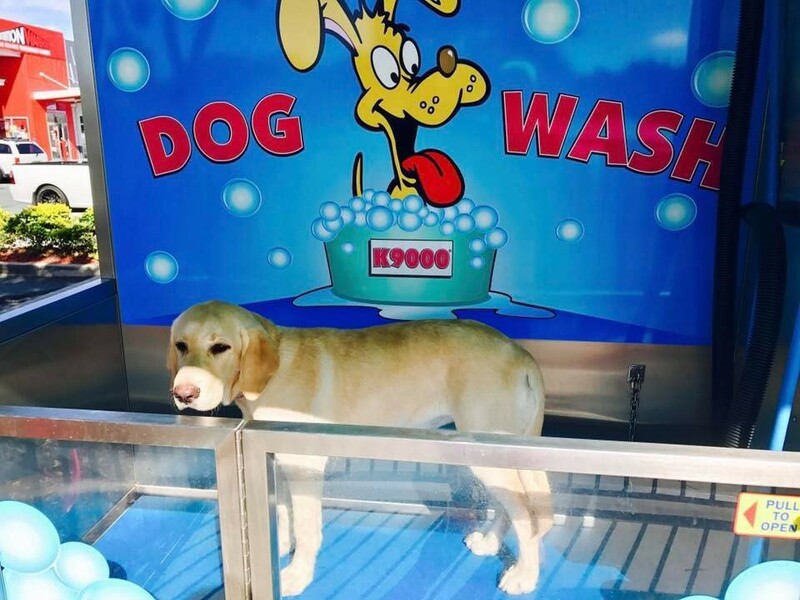 Our 10 minute, coin operated, do-it-yourself dog washes are all conveniently situated at each of our Hoppy’s Carwash locations across the Gold Coast and Brisbane, in order to make washing your dog as easy as can be. Taking your dog to the Gold Coast beach? Stop in on the way home to wash off all of that sand and salt water. Has your dog gotten a little too excited about your muddy garden or that muddy Brisbane hiking trail? Simply hose them off at Hoppy’s dog wash. Have more than one dog? Our DIY dog wash bays can wash two at once! We really do make it as easy and convenient as possible for you to take care of your pet. Plus, if all of that mud and sand has gotten in to your car’s interior, Hoppy’s Carwash can take care of that for you at the same time. Make it a one-stop-shop. You can get your car washed by us, while you take care of your dog’s wash. Now you can drive away with a pristine clean car as well as a shiny, fresh dog. Combine this with all of our locations vacuuming facilities, and pet hair on your car’s interior upholstery and carpet will be a thing of the past! Visit Hoppy’s Carwash & Café at Bowen Hills, Norman Park, Manly, Mermaid Beach, Kallangur, Oxenford or Southport for a DIY Dog Wash service that you and your pet will come back to every time.